A Trenton couple was killed and a Wilmington man was injured in a two-vehicle accident Tuesday morning at the intersection of US 22/SR 3 and SR 350. Leonard Lawson, 76, and Joyce Lawson, 73, of Trenton, were pronounced dead at the scene. Robert Beedle, 63, of Wilmington, was transported to Bethesda Arrow Springs in Lebanon. He was treated and released. According to Lt. Matt Hamilton of the Ohio State Highway Patrol, preliminary investigation shows that at approximately 10:17 a.m. the Lawsons were heading east on SR 350 in a 2006 Mercury Grand Marquis in Warren County near the Clinton County line, failed to stop at a stop sign, and their car was struck by a southbound dump truck driven by Beedle for a Morrow-based business. 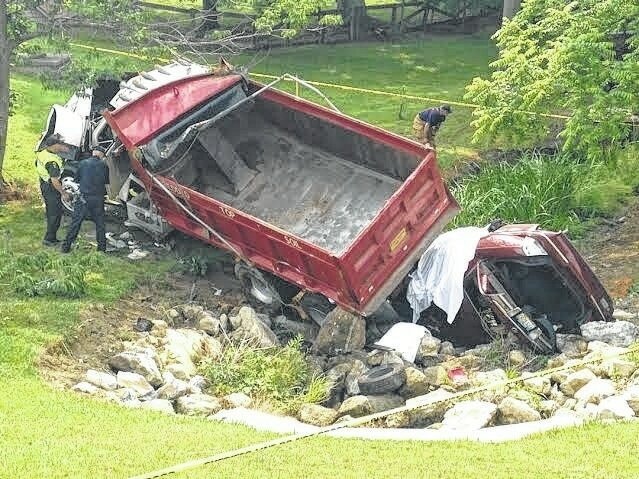 The ensuing crash, Hamilton told a Wilmington News Journal reporter, included a rollover and spun the two vehicles around, with both eventually settling in a nearby ravine. More than a dozen emergency vehicles were at the scene, including respondents from the Clinton-Warren Joint Fire District, Wilmington Fire Department, Ohio Department of Transportation and the Warren County Coroner. The Lebanon post of the OSHP continues to investigate.